GlowLytes from Josh Leavitt on Vimeo. Are you tired of your yard looking the same all the time? Do you want to do something that sets your yard apart from your neighbor’s? We did too, so we invented GlowLytes – the smart, LED based yard lighting system that you control with your smartphone or tablet. With GlowLytes you may never need to buy yard lights again. You can redecorate your yard any time you like with the convenience of your smartphone. At Christmastime you can have your lights reflect the season; when the Big Game is on you can display your team pride; during Halloween, your yard can be scary; on Valentines day, go hot pink & red; and the rest of the year your yard can look like everyone else’s – if you must – all without ever changing a bulb. 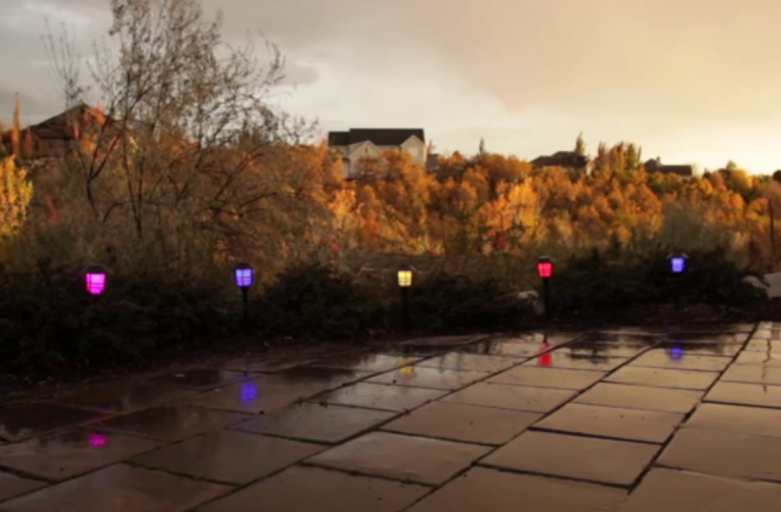 GlowLytes are smart, LED based outdoor yard lights. The system includes a main controller and up to 32 lights, controlled by your Android or IOS device through WiFi. The main control unit houses the WiFi controller and power supply. Each light is connected to the controller using standard Cat5 networking cable (but the system is NOT an ethernet system). GlowLytes use energy efficient RGB LEDs. You can save money on your electric bill and feel confident leaving the lights on all night long if you want. Are you tired of changing burned out bulbs? The LEDs in GlowLytes may last for up to 50,000 hours. GlowLytes use low-cost Cat5 cables; you can save money on the installation by doing it yourself in minutes. You don’t even need to think about exposed wires, twisting wire ends, or sharp tools. Configure GlowLytes into custom scenes to quickly change your lights at any time. You can change the color of individual lights or control them in groups. GlowLyte control is simple and intuitive and can be programmed to turn on and off according to your schedule. We have been playing with our lights through months of testing and they are a blast! Show the neighborhood your team colors; decorate for all the holidays; or any special occasion; and explore your creative side with the brilliant colors of GlowLytes. Each GlowLytes system requires a main controller unit and between 1 and 32 lights. The main controller is an embedded system running linux. Each light operates from a simple microcontroller, which implements the interface to the main controller and RGB LED control functions. We are currently using prototype plastic parts printed in ABS on a 3D printer. These parts will need to be injection molded for the production GlowLytes systems. The GlowLytes system is easy to install. You simply plug lights into the master control unit, plug into wall power, and connect to the WiFi network with your smartphone or tablet. GlowLytes use standard Cat5 network cables as interconnects between the controller and the lights. The cable carries power, and control lines that the lights use to communicate with the controller. The GlowLytes system does not use ethernet or any associated networking technology to communicate with the lights. We have built and tested 6 prototype versions of the lights and 3 versions of the master controller. We need funding to finalize the master controller design and move the prototypes into production. To produce our design we need to build 3 different plastic injection molds. These molds are for the “hood”, “collar”, and “post plug”. We also need to finalize the graphics and software, and order large quantities of parts at volume pricing. Our plan for GlowLytes is to enable control from all Android and IOS devices. We have developed all of the prototype hardware and control functions on the Android platform. By focusing feature development on a single platform we have been able to quickly iterate through software and hardware communication prototypes. During the course of our GlowLytes campaign we will continue to refine the GlowLytes app for Android. Once the project is funded we will finalize the app design and begin building the IOS app. Our IOS app is expected to be complete and submitted to the app store prior to delivery of the GlowLytes hardware. We are not currently planning a Windows Mobile control app. Ross had the idea that became GlowLytes in 2010 while experimenting with RGB LEDs. And then he nearly abandoned it after attempting to illuminate his yard with the colored LEDs. The problem was that colored light on the foliage ended-up muted and dull. Almost as an afterthought he experimented by placing a milk jug over the lights and was blown away by the brilliant color that resulted. The idea to use frosted 6 inch globes was born and worked started on the early prototypes immediately. Ross reached out to Josh (a previous co-worker) to experiment with building a smartphone controlled version of the lights. A few weeks later an early demo version of the app was running and the result was magical. The excitement for GlowLytes kept building as we worked on the prototype designs. In December 2012 we operated some working prototypes in our yards through the Christmas Season and received a huge response from our neighbors, family and friends. It seemed like everyone who saw the brilliant colors from the lights immediately wanted to buy some. The GlowLytes design has gone through many iterations. In the original design, each prototype light had an external box to house the electronics. We saw that this meant the lights would cost far too much. So in early 2013 we eliminated the box and placed the circuit board directly into the globe itself, thus eliminating the box. It cut our costs by 35%. We originally planned on using a lower cost microcontroller to communicate with the smartphone however the WiFi modules that we tried had many limitations and were difficult to use and integrate. We moved to an embedded linux module which drastically reduces the development complexity and increases the system reliability. The module is only slightly more than the microcontroller plus WiFi module combo, however it is much more capable. We have patiently continued to refined our design with 3 additional circuit board versions for the light design. Each one has been an improvement. We also resolved some communication issues relating to the networking cables. We overcame more cost challenges, and one by one, we worked through the issues until now we are confident with the electronic design. Our goal has been to create a reliable, and easy to use system and we are dedicated to continuing to this goal. During the campaign we’ll continue testing GlowLytes prototypes and refining the app. Once the molds are complete we will order the production runs for our injection molded parts. Concurrently with parts procurement, we will continue refining the Android and IOS apps. We expect to begin shipping the complete GlowLytes systems to our backers by May 30th 2014. We are offering GlowLytes systems in configurations with a controller and either 2, 4, 6, 8, or 10 lights each. All systems include a Cat5 cable and mounting post for all lights. Please help us color the world.